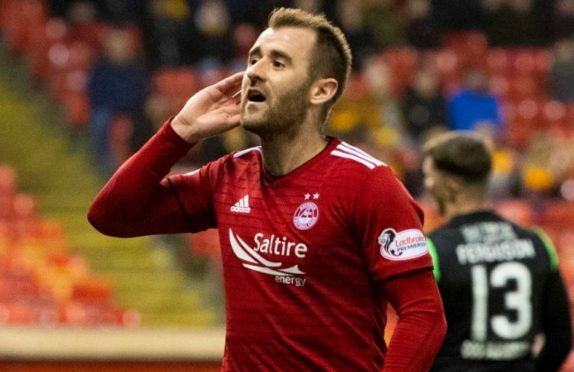 Aberdeen's Niall McGinn celebrates his goal. He struck twice in the final 20 minutes, the second a wonderful effort that cannoned off the inside of the post, as the Dons finally laid the ghost of three months’ frustration to rest on home soil. For much of the game it had looked like being the same old story, with Max Lowe’s speculative opener cancelled out by Jake Hastie’s equaliser before the break. Nerves settled in, intensity dropped off and Aberdeen appeared set for an extension to their poor recent league form at Pittodrie. However it was left to McGinn, who joined the Dons in 2012 – the last time they finished in the bottom half of the table – to salvage the three points and lift the spirits of disgruntled home fans. It will also allow the questions to cease coming Derek McInnes’ way regarding their home form. He had run out of answers as to why they struggled at home and at nearly every press conference, was fielding questions about when it would end. Well, no more. Dean Campbell, Aberdeen’s youngest player, was handed his first Pittodrie start in the place of Greg Stewart. The 18-year-old is one of several beneficiaries of manager Derek McInnes’ faith in the burgeoning crop of young players that may well be the backbone of Dons sides of the future. Akin to his role in the Scottish Cup ousting of Rangers at Ibrox, where the reserve team captain acquitted himself admirably man-marking Scott Arfield, he was paired with Shinnie in central midfield. Shinnie was back on home turf for the first time since Scotland’s 3-0 nightmare in Kazakhstan and along with Lewis Ferguson, was afforded greater licence to support Sam Cosgrove. For a player scapegoated for the national team’s inexplicable failings, he has shown no sign of shirking responsibility for club or country. His effort blazed over inside two minutes was a warning shot to a Motherwell side that did not so much stumble out of the blocks as get stuck in them. Lowe over-hit a cross to the back post and Pittodrie was braced for a collective sigh as the ball looped skyward. However, the most important man caught out was Mark Gillespie in the Motherwell goal, who backtracked helplessly as the ball dipped over him and inside the far post. After a barren run at Pittodrie – without a win in their last six – and McInnes admittedly running out of patience with his side’s home woes, their early intent will have lifted a few frustrated spirits. Connor McLennan’s willingness to drive left and right at the Motherwell defence had them retreating at will, with Ferguson exploiting the space left behind repeatedly and forcing Gillespie to parry a near-post shot clear. Motherwell had offered little and gave no evidence of their recent consistency. However, they found themselves level at the interval following a marvellous ball by Richard Tait, which picked out Jake Hastie in stride and he remained calm in rounding Joe Lewis to score. Lowe’s role in the goal – Hastie ran off him – had to be questioned. The Dons struggled to establish any semblance of rhythm after the equaliser, with their intense pressing of the first half replaced by a willing retreat, allowing Motherwell to keep possession and play their way into the game. The turning point came when Gillespie was stretchered off following a brutal collision between the goalkeeper and Cosgrove. He was down for four minutes receiving treatment and it killed the flow of the game, allowing the Dons to regroup and rethink their gameplan. Stewart went for goal from the edge of the box but Tom Aldred blocked. However the rebound rolled into McGinn’s path and he crashed it home from six yards. His second in the seventh minute of stoppage time was even better, collecting Lowe’s pass and unleashing a sumptuous effort that left Ferguson stranded. It was far from a perfect performance and there are still holes you can pick in the Aberdeen performance. But for the time being, at least their home hoodoo is consigned to the past.